At rise: An employee altercation. Look Hope Less, we cannot afford to start another day off on the wrong foot. You don’t do your work, do you? You have no idea what trepidation is, and you don’t know in what kind of trepidation I live. HA! You think you’ve got complaints! My husband didn’t want me. Years of that. Of convincing myself. Of thinking, good, he won’t give in to my vanity. But I’m a woman and I’m beautiful. I should be able to buy things. Well, I am someone who needs many hours for contemplation. As if you’re the only one? As if. I need to see part of the green wall in my kitchen at least 45 minutes a day. I have to make time for that. Green!! Do you hear me? GREEN. No reason to get all revved up. Photos should be taken of me. I should be remembered this way. Everything breaks apart in the morning. Come on now. Back to WORK. 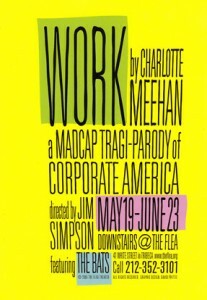 This play was previously presented at Clark University by CUPS under the direction of Vanessa Gilbert.